The weekend is finally here and I've got a million and one things I want to do. There's a Eva Franco warehouse sale that I want to hit after work tomorrow, and then I need to go to Beverly Hills to pick up one of my presale bags and to return a bag that didn't work. I hate returning things, but luckily this was an online purchase so there won't be a ding in anyone's commission check. 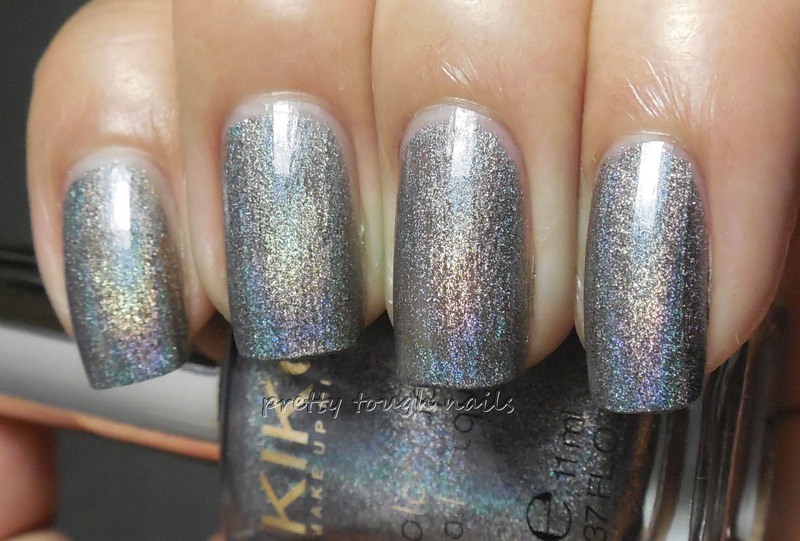 I recently got my hands on a Kiko holo, numbered 400 which is a dark silver holo. The Kiko holos have been out now for about a year, but since they're not available in the US, it took me a while to find one. It didn't disappoint either, it glided on really smoothly and two coats was enough for coverage. The holo is above average, but not as holo-y as the recent Color Clubs. I would say this is similar to the holo-ness of Nfu Ohs. It dried fairly shiny on its own, so no topcoat needed as shown in these pics. First two pics in the light tent so you can see that it's more of a greyish silver shade. Next, under direct light to see the holo rainbows. I love the shade of this silver - most holos are either a light silver or a dark charcoal, but this is more of a dark silver which is really nice and unique. I really wish Kikos were easier to obtain here in the states, but I guess the rarity of this brand for me makes this particular polish more special in my collection. Do you have Kikos in your collection, and if so, what makes them stand out for you?